All of my most pertinent comments regarding Robotech: The New Generation's sound and animation were made in my review for Volume 1; you are invited to read it if you haven't already. The final Robotech saga concludes with the release of Robotech: The New Generation Volume 2 this week. Like the other volumes of the series, Manga has put together a two-disc collection, featuring twelve episodes of Harmony Gold's seminal Saturday-morning cartoon series. 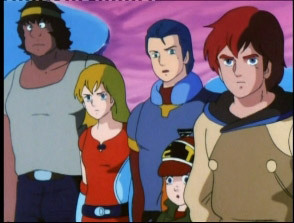 The New Generation, adapted from Genesis Climber Mospaeda, was mostly popular with newer viewers, but never quite garnered the popularity of the original Macross Saga. Speaking as a non-fan with only a passing familiarity with the series in general, I can only comment on what I know, but from what I've seen, the third and final saga is both entertaining and exciting. After the victory that Scott Bernard's intrepid band of freedom fighters enjoyed at the end of Volume 1, tensions within the team begin to rise. 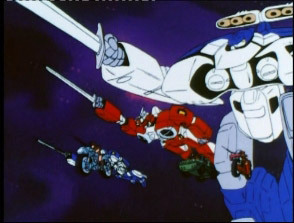 With the evil Invid's command center, Reflex Point, growing ever closer, the team must learn to work together and overcome the differences in their personal philosophies – including Scott's tendency to treat the mostly-untrained desperados as if they were a true military unit, which makes the simple scavenger Rand see red. The other aspect of the plot that is played up in these final episodes is the truth about Marlene, a new addition to Scott's team, who looks almost exactly like his dead fiancé. In reality, Marlene is a "simulagent" – an Invid who looks like a human (similar to some of the characters in the new Battlestar Galactica), and has been sent to infiltrate their operation. Although Marlene's true nature was revealed to the viewer some episodes previously, the team do not learn her secret until much later. The practice of hiding a character's intentions and using him or her as a "spy" is a well-worn plot device, and has been used throughout the ages in a great many films – whether featuring freedom fighters or simply ordinary armies. There are two ways to use this concept: either reveal the spy's secret to the viewer upon their debut as a character, or keep their intentions hidden from the viewer until the "good" characters finally uncover the truth. While I favour the second model, both are valid. In the first scenario, the viewer is given manufactured tension by their knowledge that the spy could betray the good guys at any time. In the second, the revelation that a character who was thought to be good is actually a spy for the "baddies" is often used as a shocking cliffhanger to both the good guys and the viewer. Here, having the viewer know of Marlene's true nature from the outset allows the series to introduce an aspect of the character that would not otherwise have been present – Marlene is amnesiac, does not remember that she is an Invid, and begins to fall in love with Scott. This gives her a unique perspective on humanity, far removed from the Invid's ideals of genocidal destruction. To say more would be to spoil the story, but suffice it to say that The New Generation – and thus, the Robotech story – ends as any Saturday-morning cartoon of the era would. Robotech has gone down in history not only as the animé that popularised the genre for the Western world, but as one of the most popular of the adapted-animés that were rife on American television at the time. And – uncommonly for a medium geared towards children – it tells a good, intelligent story. There will likely be no other series quite as influential to animé history. A solid 4:3 transfer with good contrast and colour, with prime colours particularly strong. The sharpness is good, but a few notches short of perfect. There is no obvious blurring to suggest a low grade NTSC to PAL transfer. The 5.1 soundtrack is quite inclusive, with music and sound effects using the full sound stage, and properly so (several 5.1 'remixes' are anything but) – the sound of a rocket fired towards you travels from the front to the back. Like Volume 1, there are no special features present. This, I suspect, was done in order to get all twelve remaining episodes into one two-disc set. My thanks go out to the guys from the irc.robotech.com chatroom – parts of this review could not have been written without their encyclopaedic knowledge of the series. Cheers!